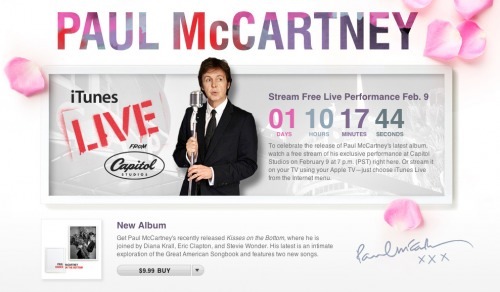 Apple is planning to stream a free live performance by Paul McCartney on iTunes tomorrow. To celebrate the release of Paul McCartney's latest album, watch a free stream of his exclusive performance at Capitol Studios on February 9 at 7 p.m. (PST) right here. Or stream it on your TV using your Apple TV - just choose iTunes Live from the Internet menu. Paul McCartney's recently released album, 'Kisses on the Bottom' can be purchased from iTunes for $9.99.